George Galloway, the Respect Party, Nigel Farage and Natalie Bennett all appear not to have an entry in the ICO’s online register of data controllers. Failure to have an entry in the actual register constitutes a criminal offence if no exemption can be claimed. Section 17 of the DPA states in broad terms that a data controller (a person who solely or jointly “determines the purposes for which and the manner in which any personal data are, or are to be, processed”) must not process personal data unless “an entry in respect of the data controller is included in the register maintained by the [Information] Commissioner” (IC) or unless a relevant exemption to registration applies. Accordingly (under section 18) a relevant data controller must make a notification to the IC stating (again in broad terms) what data it is processing and for what purposes, and must pay a fee of either £35 or £500 (depending on the size of the organisation which is the controller). Section 19 describes the register itself and also provides that registration lasts for twelve months, after which a renewed notification must be made, with payment of a further fee. Section 21 creates an offence the elements of which will be made out if a data controller who cannot claim an exemption processes personal data without an entry being made in the register. Thus, if a data controller processes personal data and has not notified the IC either initially or at the point of renewal, that controller will be likely to have committed a criminal offence (there is a defence if the controller can show that he exercised all due diligence to comply with the duty). (all the entries have more information in them than those screenshots show). Nonetheless, the online register is there for a purpose – it enables data subjects to get reassurance that those who process their personal data do so lawfully. Non-appearance on the online register is at least cause for concern and the need for clarification from the IC and/or the data controller. 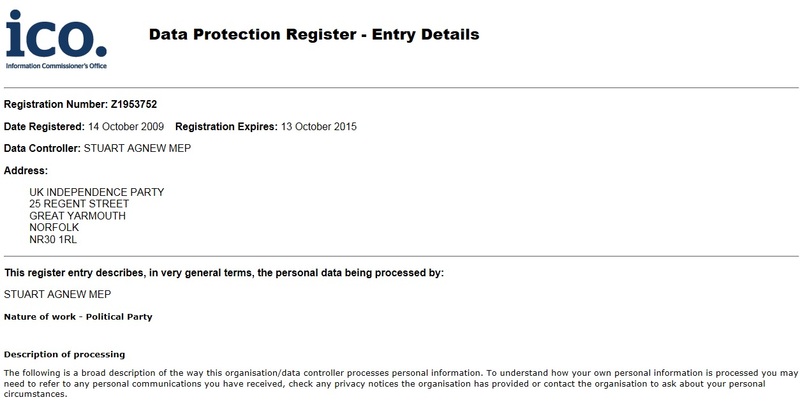 And it is not just Mr Galloway and the Respect Party who don’t appear on the online register. I checked for registrations for some of the other main party leaders: David Cameron, Ed(ward) Miliband and Nick Clegg all have registrations, as do Nicola Sturgeon and Peter Robinson, but Nigel Farage, Leader of UKIP and Natalie Bennett, Leader of the Green Party appear not to. At all times, but especially in the run up to the general election, voters and constituents have a right to have their personal information handled lawfully, and a right to reassurances from politicians that they will do so. For this reason, it would be good to have clarification from Mr Galloway, the Respect Party, Mr Farage and Ms Bennett, as to why they have no entry showing in the IC’s online register. And if they do not have an entry in the register itself, it would be good to have clarification from the IC as to what action might be taken. An interesting and pointed summary.